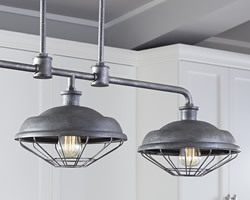 These linear pendants in Antique Reproduction style are ideal over an island or a long dining room table. Many have down lights to light a pool table without compromising your traditional or historic interior design. Taking inspiration from historic sources or new eclectic concepts in lighting, these pool table lights and island pendants are far from ordinary. 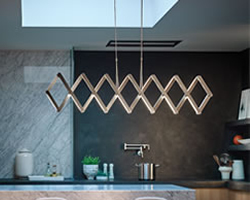 These linear pendants are suitable for lighting a pool table, bar or island. Brushed finishes with sleek design lines make this style work with almost any interior. To light a bar or island or to light a pool table, there is a wide variety finishes, styles, brands and lines. These linear pendants light a pool table or add functional light for an island, bar or table without giving up utilitarian functionality for clean aesthetics. Rustic pendants and pool table lights for your log cabin or lodge or to add a rustic feel to any home. From classic handcrafted Arts & Crafts style pool table lights to metal finished and glass pendants, these are a traditional choice for over your pool table or over your kitchen bar. 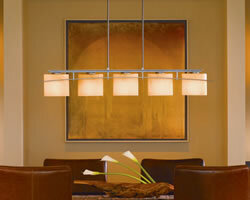 These pendants have 2, 3 or more down lights to cast work light over an island or bar or to light a pool table. Casual transitional style works with many interiors. These chandeliers are oval in shape. They are ideal for over an island or a long dining room table. Antique Reproduction Island Chandeliers coordinate with many historic styles. Many feature distressed softened metal finishes in iron, gold or silver finish in patinaed metal or painted finish. There are a wide variety of pendant clusters that are a great choice to light a pool table or over a bar.